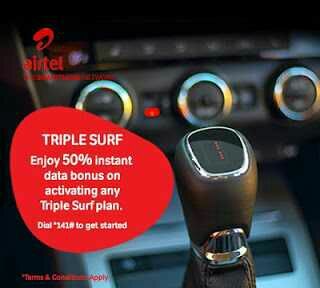 Airtel triple surf offer is the latest from Airtel Nigeria which offers 100% bonus on data purchases and subsequent renewal to reward its subscribers. This Airtel bonus only gives you bonus data, based on your current Airtel data plan and subsequent subscription to that same plan. For example, if you subscribed to android 1 plan for N1,000, you get 1.5GB, when it expires, you subscribe to the same plan again and get extra 50% ( 1.5GB + 750MB = 1.25GB). When it expires again, you subscribe and you get extra 50% of 1.25GB ( 1.25GB + 1.1GB = 2.3GB). If you continue the subscription you get extra 50% of 2.3GB ( 2.3GB + 1.2GB = 3.5GB) for that same N1000. • Select option 2 from the onscreen menu “Triple Surf Offer”, you will see the list of applicable bundles. • Just select and activate any of the applicable data bundles and you will begin to enjoy your bonus. Airtel triple surf is simply, " the more you subscribe, the better the bonus given to you" which becomes a chep data plan on the long run.